Bnei Zion (Hebrew: בְּנֵי צִיּוֹן, lit. Sons of Zion) is a moshav in central Israel. 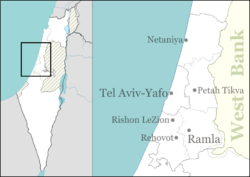 Located in the Sharon plain around four and a half kilometres north of Ra'anana, it falls under the jurisdiction of Hof HaSharon Regional Council. In 2017 it had a population of 1,401. Bnei Zion was established on 27 March 1947 by the Jewish Agency for Israel, and was initially called Gva'ot Ra'anana (גבעות רעננה, lit. Ra'anana Hills) before being renamed after Bnai Zion, the American organisation that helped found it. Just west of the moshav is a 100-dunam nature reserve, declared in 1968. The reserve is a remnant of the natural state of the Sharon plain, rich in flora that grows well in iron-rich soil. ^ "Bnei Zion Nature Reserve" (in Hebrew). iNature.info. Retrieved 2010-10-12. This page was last edited on 22 July 2017, at 09:14 (UTC).